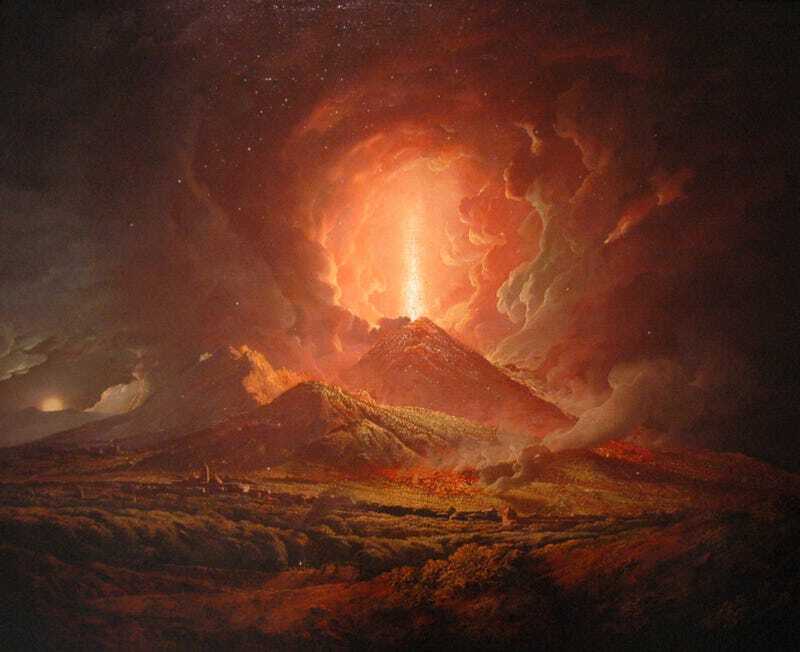 With the movie Pompeii exploding into theaters, you'll be exposed to a lot of myths about the volcanic eruption at Mt. Vesuvius that buried a whole Roman town. The biggest myth of all is that the citizens of Pompeii never knew the blast was coming. They did. And many had already evacuated. In real life, Pompeii was an ancient Roman resort town built at the base of the volcano Mt. Vesuvius. Its citizens were killed instantly in 79 AD by a blast of superheated gas from an eruption, and their city was perfectly preserved by the thick rain of ash that followed. Archaeologists excavated the town over the past century, discovering beautifully-preserved examples of Roman art and architecture. What you're probably most familiar with are the bodies that were found, in positions of fear and horror at their impending doom. These weren't actually bodies, of course — the famous figures you've seen are actually recreations. Archaeologists found hollowed-out places in the ash where the actual bodies had rotted away, then recreated what they looked like by pouring plaster into the cavities. Even in classical antiquity, people knew that earthquakes near a volcano often meant bad news. Today, scientists say quakes are one warning sign of possible eruption. Pompeii was prone to quakes, but about fifteen years before the big blast there had been a quake strong enough to level huge parts of the city. At that point, many people abandoned Pompeii. For upper class Romans, this was a resort town where they had vacation houses — fearing the worst, they simply never returned for another getaway. Indeed, at the time the volcano froze the town in ash, a lot of those vacation houses were still abandoned and in a state of disrepair. But there were other warning signs, too. Reports from eyewitnesses reveal that the that volcano began erupting at least a day before the hot gas blast that killed about a thousand people. The early eruptions caused enough terror, however, that thousands had already evacuated by the time the deadly events took place. Most of the people who remained in the city were likely too poor to leave, or had nowhere else to go. Many were probably servants or slaves. Some of the other people who remained included local politicians too, like the mayor, who went down with his city. The point is that nobody was surprised by the eruption of Mt. Vesuvius at Pompeii, and it wasn't a disaster that came out of nowhere. People had known the town was dangerous for years, and they had at least a day to evacuate if they could. Yes it was a terrible tragedy, which is why we have historical records from the era that tell us about what happened. But it is certainly not the epitome of "surprise doom" the way movies and stories make it out to be.